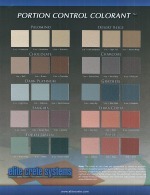 Here are my color charts for the different decorative concrete applications I install. Below you'll see color charts for concrete staining, integral color chart for coloring concrete floors and stamped concrete, and color charts for epoxy concrete floors. 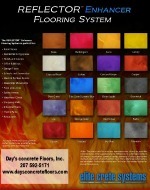 We have a lot of color choices to choose from when you want to stain your concrete floor. Click HERE or on the charts to the right for a larger image. We can change the color of the gray concrete that comes out of the concrete truck to many different colors. 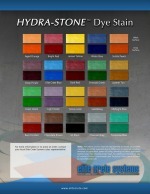 Here's my color chart for coloring interior or exterior concrete projects. Here's our color chart for applying solid color epoxy paint to concrete floors or for a base coat in our decorative chip epoxy floors. 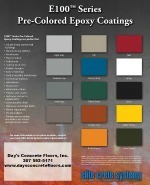 Our designer epoxy color chart has many metallic colors to choose from. When you're looking for something different, this type of epoxy flooring is highly decorative, beautiful, and wild all rolled into one. 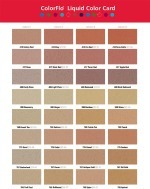 This is our color chart for doing decorative chip epoxy flooring. You can choose from solid colors, blended colors or pick your own colors to blend together. 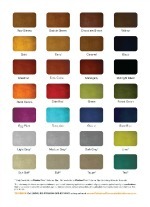 This is our color chart for resurfacing concrete and coloring our stamped concrete overlays. We are trained to install all the above applications. When you're looking for an experienced decorative concrete contractor in Maine, there's no need to look any farther. Contact us for a quote today!